Via collider.com: The official poster for Michael Knowles‘ upcoming film The Trouble with Bliss. 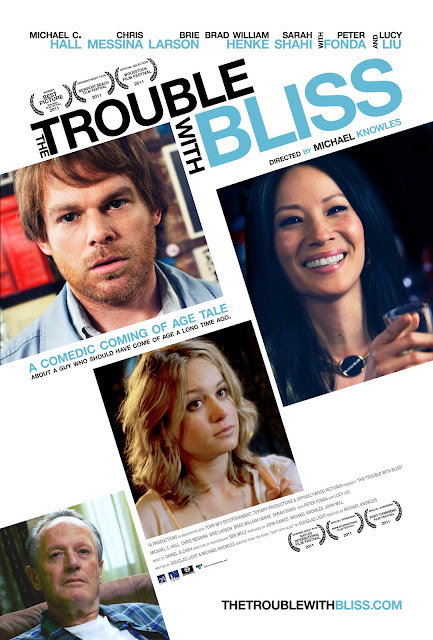 The movie stars Michael C. Hall as Morris Bliss, a guy who begins breaking out his inert lifestyle by juggling relationships with the sexually precocious 18-year-old daughter (Brie Larson) of a former classmate and his very forward neighbor (Lucy Liu). It’s an interesting poster in that you look at Hall and realize that his character probably isn’t going to kill anyone. The film also stars Chris Messina, Brad William Henke, Sarah Shahi, and Peter Fonda. The Trouble with Bliss hits VOD and theaters in New York City on March 23rd. The film opens in Los Angeles on March 30th. I like gamer. It's shows how scary simulcra recreation can become. I thought the movie was called East Fifth Bliss. Can anyone help me out with that one??? During production films tend to change their title depending on a variety of things. For instance: East Fifth Bliss was the title of the novel it is based around. But, The Trouble With Bliss is more attractive for audiences and marketing. It also makes the movie sound more attractive. Now--The book seems to be changing titles as well to coincide with the film.